“All who are tired from carrying heavy loads.” Matthew 11:28 NLT. Doing life God’s way works best. Doing life your way will never satisfy your heart. Jesus promises people the deepest kind of rest. And just how does Jesus accomplish that? He invites the weary to work alongside Him, and with Him. How does labor result in rest? Jesus’ words seemed to contradict what people had previously experienced. Predominantly, work was manual and often exhausting. Maybe today, or at some other point in your life, you have felt physically exhausted, or emotionally depleted, or spiritually weary. Weariness takes varying forms. When Jesus spoke of effort, labor, and weariness, His listeners knew that He was talking about work. Their daily lives were agricultural, and their livelihood depended upon the soil and the sea. They ate and bartered with what they could raise or catch. Neither was an easy task; both involved long and tedious hard work. A farmer’s yoke for his oxen or the fisherman’s net were identifiable symbols of strenuous effort and physical weariness. And sometimes after all their best efforts, there still were disappointing results. Exactly, to whom was Jesus talking? The Bible is clear. 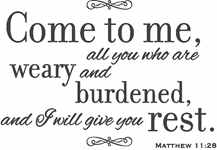 Jesus invited, “All who are tired from carrying heavy loads.” Matthew 11:28 NLT. Are you one of those? Heavy loads are not always external. Sometimes they are more internal – unseen by others but not unknown by you. That heavy load could be confusion, emotions, worries, weariness, regrets, disappointment, mistakes, or uncertainties that can all weigh on your mind, weaken your hope, and weary your body and soul. Here are three simple things Jesus will teach you. (1) Do what pleases God. Anything else is extraneous and less important. Jesus lived without anxiety, uncertainty, frustration, or failure. Learn from His example:Jesus prioritized obedience above all else. “I always do what pleases the Father.” John 8:29 NIV. That is bedrock upon which to build an abounding life. Serving God without learning what pleases Him is needlessly exhausting and fruitlessly ineffective. The Bible is clear. “Live a life worthy of the Lord, please Him in every way, bearing fruit in every good work, and growing in the knowledge of God.” Read Colossians 1:9-12 NIV. (2) Do what God is doing. “Whatever the Father does, the Son also does. For the Father loves the Son and tells Him everything He is doing . . the very work that the Father has given Me to finish . . I am doing.”John 5:19-20/36 NLT/NIV. Life is best when you invest yourself in things eternal, rather than wasted on what is only temporal. (3) Do everything at God’s direction and with His anointing. “The Son can do nothing by Himself. He does only what He sees the Father doing.” John 5:19 NLT. Why live your life without including a great God? Nothing could be worse than coming to the end of your life and stand before a loving God with regret that so many years were wasted that could have been better invested in matters eternal. Why squander a precious life too busy about things temporal but not eternal? Jesus gives His invitation to life, abundant now and eternal forever. Now, He awaits your initiative to obey. Today, I pray for you to find assurance and contentment in life. Looking and seeing are not the same. ”I pray that the eyes of your heart may be enlightened.” Ephesians 1:18 NIV. Poetically, Shakespeare described the eyes as, “the window of the soul.” Your eyes and countenance mirror health and happiness as well as worry or weariness. There is much about a person that is mirrored in their eyes. I suggest that is also true of your spiritual life. Jesus explained, “When your eyes are healthy, your whole body also is full of light . . Therefore, if your whole body is full of light, and no part of it dark, it will be just as full of light.” Read Luke 11:33-36 NIV. Too much of life is spent looking without really seeing. There is goodness and beauty all around you, when you have eyes to see from the heart. Often, we can see only the reflection of our own heart. When you see with love you achieve understanding. I think that would describe me in a museum or art gallery. I have wandered through world famous art museums in London, Berlin, Turkey, the world-famous Rijksmuseum in Amsterdam, and the Musee du Louvre and Musee d’Orsay in Paris. Now an embarrassing confession. My wife, Gayle, was the one who saw more than I was capable to appreciate. In every instance, I was more tourist than art-lover. On one of those occasions, I recall watching a young student enthralled before a masterpiece, studying every brush stroke and vivid color while sketching a painting that I had glanced at for only a few moments, admired briefly, and then moved on. I looked. That student studied every exquisite detail with awe. Through the eyes of her heart, she saw beauty my eyes could not. I looked at the same priceless masterpiece but lacked the capacity to appreciate the priceless beauty before me. I believe that is true in life and love. Until life is seen through the eyes of your heart, you will not see God’s masterful artistry in yourself or others.Some look at the Bible and the heart of the loving God it reveals yet see only His commandments without seeing His selfless compassion, sacrificial gifts, and sufficient grace. When you look with your heart, you will see what is plainly there to see. God loves you. I have found this to be true. If you’re not looking through the eyes of your heart, you won’t see what you need to see. Look for God in your everyday life; look around you for His goodness in yourself and from others. He is there; open your heart. The truly spiritual life is no casual walk in the park. A spiritual life requires discipline, commitment, and sacrifice. In those, you meet and know God. An indescribable day awaits you. ”For now, we see only a reflection as in a mirror; then we shall see face to face. Now I know in part; then I shall know fully, even as I am fully known.” 1 Corinthians 13:12 NIV. You will see what you most need to see when you are where God wants you to be. God welcomes you to meet Him in a place where you can know Him more fully, love Him sincerely, and enjoy Him completely. ”So, we fix our eyes not on what is seen, but on what is unseen, since what is seen is temporary, but what is unseen is eternal.” 2 Corinthians 4:18 NIV. Today, I pray for you to have a heart to see God in every day and moment.